Parish parking will be available in the adjacent 311 W. Illinois building one hour before all weekend Masses, weddings, and other parish events. Assumption will have the use of the first 35 spaces in the garage and there is a dedicated staircase and elevator for our use. 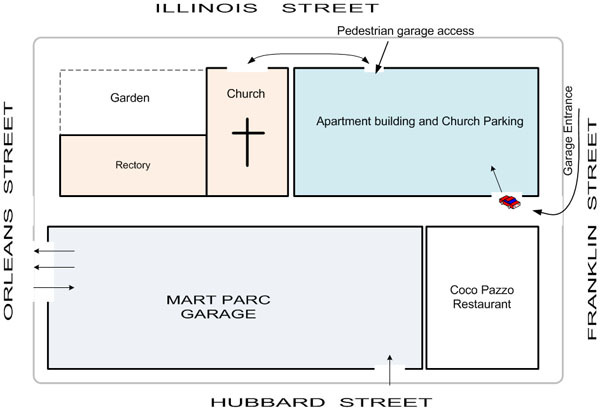 The pedestrian entrance to the garage is on Illinois Street, very close to the church entrance. The small number of people who drive to weekday Mass and those who come for appointments will continue to enjoy validated parking at MartParc (which will also be our overflow parking option). MartParc is accessible from Orleans St ot Hubbard St. See the map below.